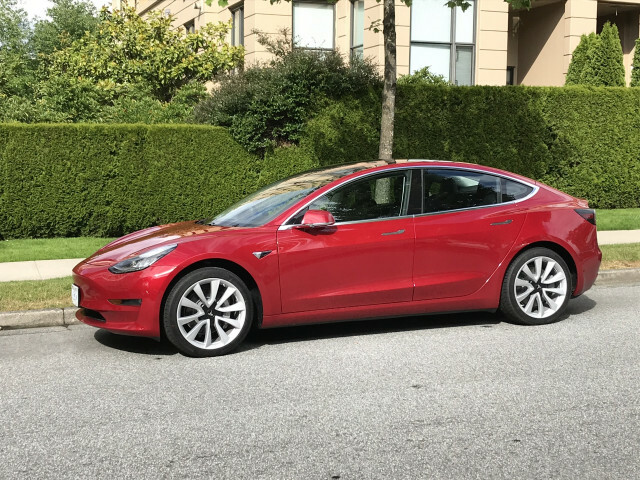 Tesla started off Model 3 sales in Canada in May with a bang and sold 456 cars after a flurry of deliveries at the end of the month, according to vehicle registration data compiled by IHS Auto. Model 3 sales in Canada continued building through June. The evidence points to Tesla boosting Model 3 deliveries to Canada for two reasons. First, sending vehicles to Canada could have helped postpone Tesla's 200,000th delivery in the U.S. until the third quarter. The 200,000th sale triggers the roll-back of the $7,500 federal tax credit in the U.S., and extending it into the third quarter could postpone the rollback for Tesla buyers for three months. A second reason could be the June election in Ontario, in which the leading candidate, Doug Ford, said he planned to cut back that province’s generous electric car tax credits that could reach as high as $10,645 ($14,000 Canadian). Ford went on to win the election June 7, though the credits are still in place for now. The 456 Model 3 sales were only the fourth highest among electric cars for May, but still accounted for the 10th highest sales for a single electric car model in a single month in Canada. Tesla’s Model 3 total built on the sales strength of other electric cars for the month, including the Nissan Leaf, Chevrolet Bolt EV and Volt, Mitsubishi Outlander, and Toyota Prius Prime, as reported in Green Car Reports’s May Canadian sales round-up. Helped by strong showings from the Hyundai Ioniq PHEV, Chrysler Pacifica PHEV and Ford Fusion Energi (with roughly 200 sales apiece), May’s plug-in electric vehicle sales came within a hair of 5,000 units—far and away their most successful month in Canada. Plug-in market share rose to 2.3 percent in May, a mere eight months after hitting 1 percent for the first time (in September 2017). June sales look even stronger. “Bursting” Through 3 Percent in June? Tesla’s secrecy makes it difficult to guess at delivery volumes prior to the publication of vehicle registration data. 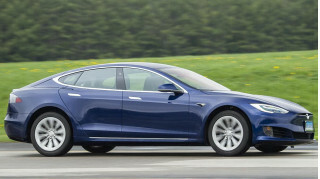 Buyers who wheedled information from Tesla store representatives gave the impression of Canada-wide delivery targets in the 1,500 to 2,500 unit range in June, though these would have included the 456 in May and may have included Model S and Model X deliveries. 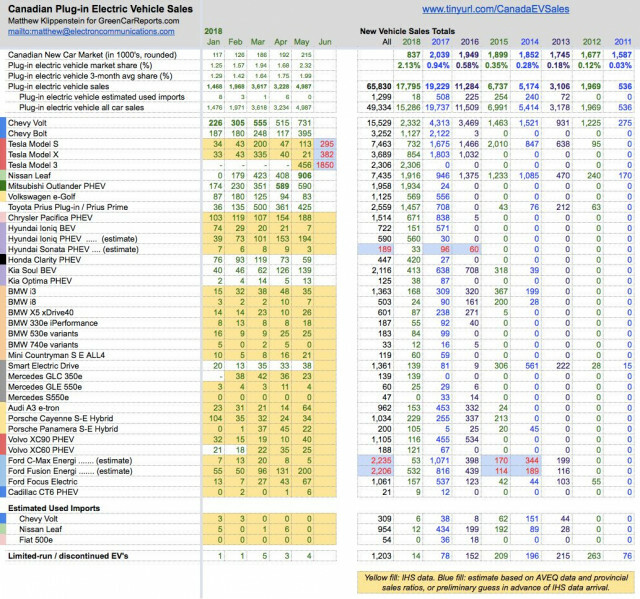 Reader Troy from the Tesla Model 3 Owners Club (Twitter: @TroyTeslike) analyzed data from member reports and a Tesla presentation to guess that Canada would see 296 deliveries in May and 1,023 in June. Extrapolating from the 456 actual May sales, this would imply Canadian Model 3 deliveries in June of about 1,600, a month-over-month increase of nearly 1,000 cars. Tesla reported 18,440 total Model 3 deliveries in the second quarter, with InsideEVs estimating 3,875 U.S. deliveries in April, 6,250 in May, and 6,050 in June. This leaves 2,265 deliveries in Canada for May and June. Subtracting the 456 in May would leaves 1,809 Model 3 deliveries in Canada in June, fairly consistent with the adjustment to Troy’s analysis. Never wanting to underestimate Tesla, Green Car Reports will estimate that Tesla sold 1,850 Model 3s above the 49th parallel in June, being both a round number and one with hockey significance. If Tesla can increase month-over-month Model 3 deliveries by 1,500 units, and if automakers rush to clinch sales in Ontario before the repeal of provincial rebates, the Canadian plug-in electric vehicle market could top 6,000 units in June. This would put the sector on the cusp of 3 percent market share—a notable achievement. Doubly so, because if the Ontario government does unplug electric vehicle policy support, it could take years for the Canadian market to return to June’s high-water mark.